I had the priviledge to visit Kanzaki Shiho at his studio last November. Hearing that he passed away I want to share this. 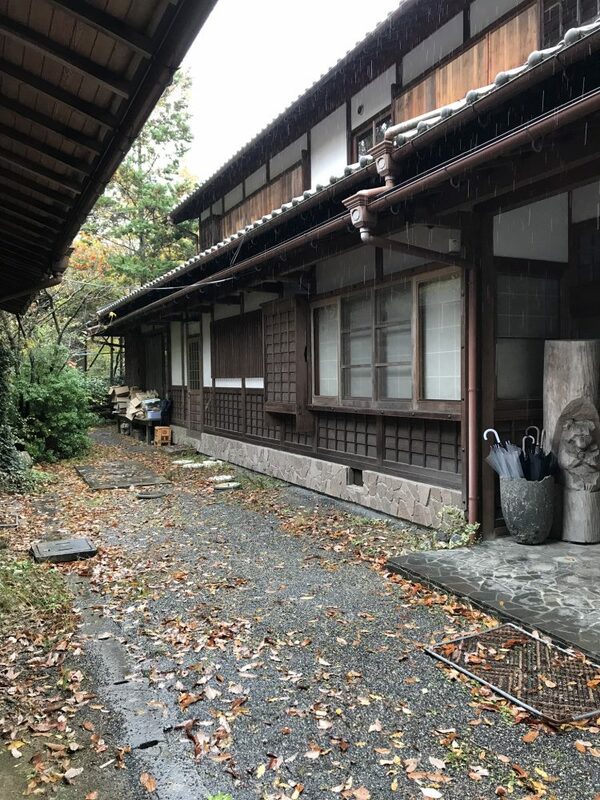 I visited Shigaraki for a day, 4 years ago and left dissatisfied – a wander around the cultural park with not a lot happening, and a sprawling, seemingly empty town. It was all a bit bleak (except for the ‘saki bottle gallery’). 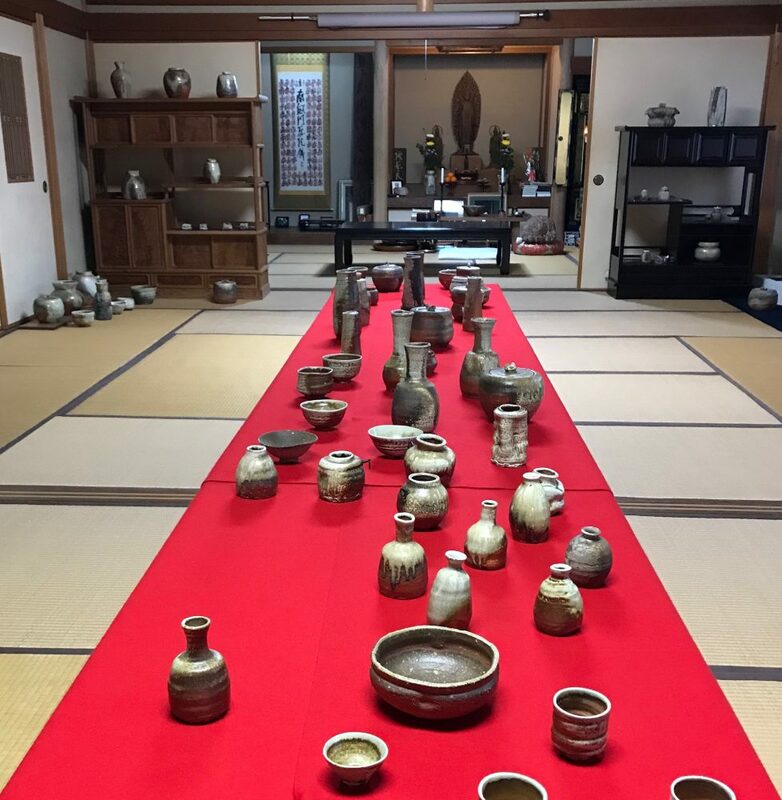 This time we really needed to visit potters to get a feel for the spirit of the ware and a better understanding of the long anagama firings for which it is famous. 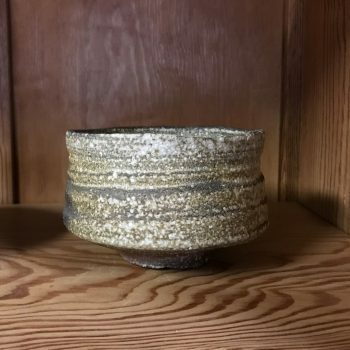 A potter friend who apprenticed in Shigaraki suggested Kanzaki as being very welcoming, despite his great reputation. I’m always a bit hesitant just to turn up at working studios, partly because they might be working, partly because of that rejection feeling! (Not that that has ever happened with a potter yet). So I messaged him on Facebook with our dates and he was back to me the next day with a time that would suit him for our visit. Amazing. He was quiet and obviously somewhat frail but he sat with us by the smouldering sunken hearth, answered our questions, spoke a little of his life in Shigaraki and his kiln. We were glad to have a Japanese speaking friend with us, although he spoke good English, it was easier for him to switch between the two, and there was more laughter in Japanese, especially about his nickname – the Wolf. We looked at his work displayed in the large tatami matted gallery, he signed his book for us (we couldn’t afford the pots!). After about half an hour we took our leave, he told us to be sure to look over his kilns on our way out. I think we came away feeling that we had had a glimpse of what makes Shigaraki ware so great and highly esteemed. In no small part it comes from the generosity and tenacity of its potters which matches the richness and ‘flavour’ of its clay. Here are a few of the pot photos from our visit. Kanzake Shiho, I love the softness of the form, like a leather bag full of water. 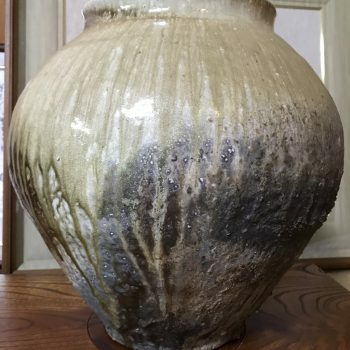 Kanzake Shiho, large jar, anagama fired. Kanzake Shiho signing his book, November 2017. You now know the feeling of being in the presence of humble greatness – as we felt when we visited Kanzaki san some years ago. He was not well then, but was so comfortable in his own skin….totally assured of the wonder of his pots, but allowing them to speak rather than him giving them or us the ‘sales talk’. We also had the pleasure of meeting his son-in-law, who is an accomplished potter too. 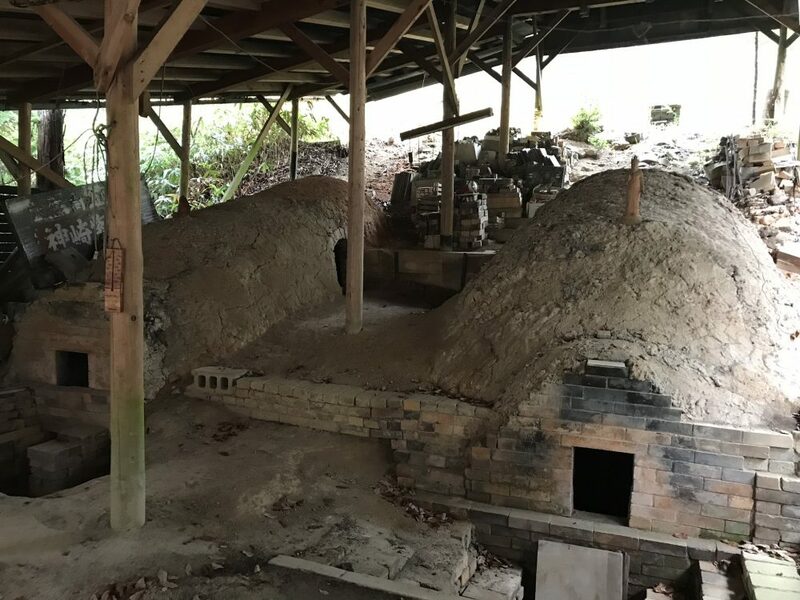 He was attending to the kiln at the time of our visit. I’m somewhat saddened that you did not find pottery and potteries to trigger your excitement in Shigaraki. It is now several years since we visited, but then we were delighted with what we encountered. Maybe changing times and economies have wreaked their wrath. Thank you for advising us of Kanzaki san’s passing. It is something we note with regret. Hi Karen and John, yes it was a very special meeting, and more so with hindsight. 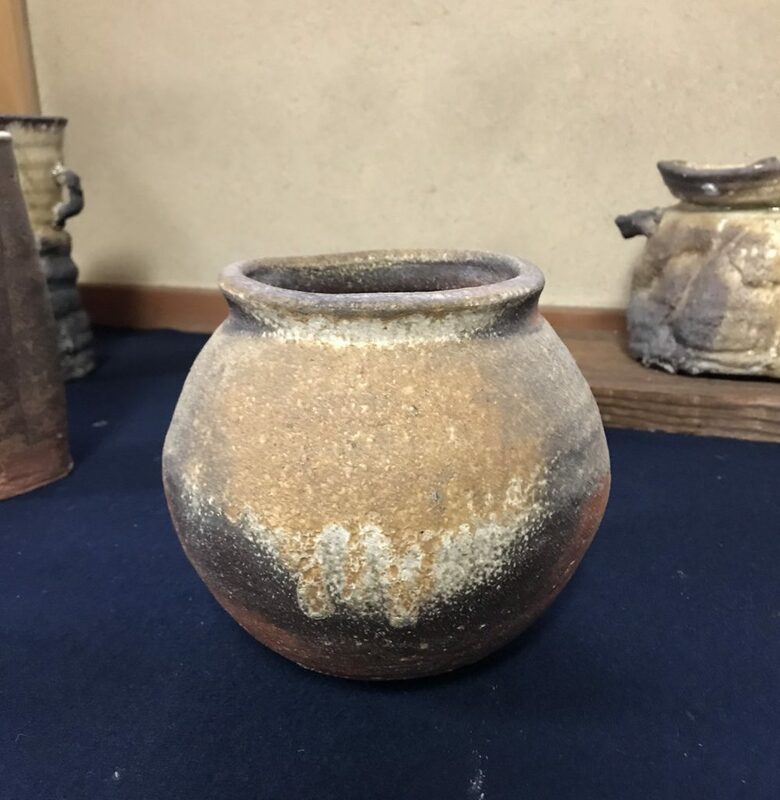 You’ll be glad to know that we saw some spectacular Shigaraki pots, one of which came home with me! It was our previous visit which had fallen somewhat flat, this visit was beyond expectations, I am so glad we persisted and returned. Perhaps one day you’ll have another visit too.